Today’s #SundaySupper is all about retro foods — dishes that were popular in the 50s, 60s and 70s. 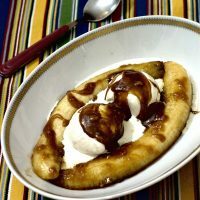 Bananas foster is a classic 1950s dessert, with sautéed bananas, caramel rum sauce and vanilla ice cream. Today, the Sunday Supper group is traveling back in time to celebrate dishes popular in the 1950s, 60s, and 70s. Yes, we’re going retro! 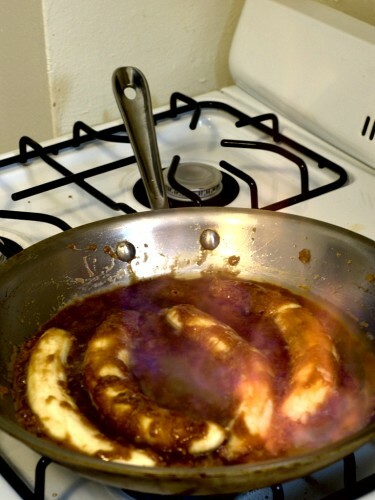 I decided on a very classic 50s dish, bananas foster. It was created in 1951 by Paul Blangé at Brennan’s Restaurant in New Orleans. It was named for the chairman of the New Orleans Crime Commission, Richard Foster, who was a friend of the restaurant’s founder. 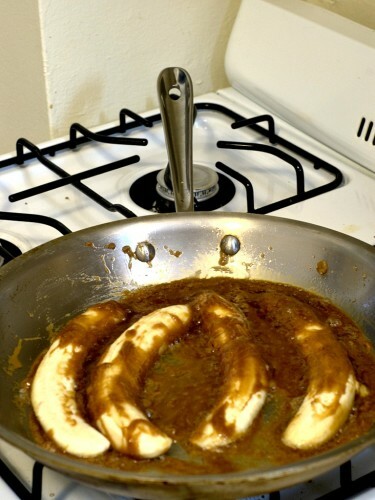 In this dish, Bananas are sauteed in butter and sugar until a caramel sauce forms, then rum is added and set aflame. Don’t worry, thanks to the croissant disaster of 2007, I have a fire extinguisher. It’s a relatively simple dish, with few ingredients, and no difficult techniques. If you don’t have banana liqueur, you can simply leave it out of the recipe. But I just told you how to make it at home, so now you have no excuse. The initial flame when you light the pan is impressive. It settles down, then takes about 30 seconds to burn itself out. It’s actually the vapor from the rum that is flammable, not the rum itself. Be sure to take the skillet off of the burner before adding the rum, and keep a pot lid and/or fire extinguisher handy for safety. Melt the butter over medium-low heat. Add the brown sugar and stir until the sugar melts (this takes a while). Remove the skillet from the heat and add the banana liqueur and the split bananas, cut-side down. Set the skillet back on the heat and cook the bananas until slightly soft, periodically spooning sauce over the bananas, and the sauce turns a light caramel color. Gently remove the bananas from pan to two serving dishes. Bring the sauce to a simmer. Remove the skillet from the heat again and carefully add the rum. Do not stir. VERY carefully, set the skillet back over the burner and using a long grill lighter, ignite the rum and continue cooking until flame dies out, approximately 1 to 2 minutes. If the sauce is too thin, cook for 1 to 2 minutes until it is syrupy in consistency. Divide the 1/2 pint of ice cream between the two serving dishes. Spoon the sauce over the ice cream and serve immediately. Don’t forget to check out these other Sunday Supper Retro recipes! This brings back some memories of mine when we went to Florida for a vacation back in the 80’s and had dinner at a restaurant where they made this tableside. It was so good. Those caramelized bananas are calling my name! I love how bananas foster really has not gone out of style. 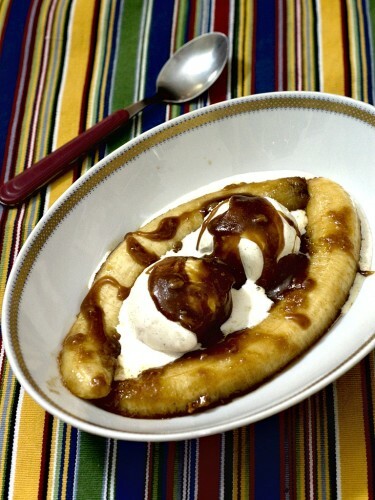 It still seems to be a classy dish to serve…after all caramel, bananas and ice cream is super yummy! Such a delicious, impressive dessert! I’d love to make this for a dinner party! Love, love, love bananas foster! Your action pictures are so cool! The first time I had bananas foster was with my dad on a trip to Disney. Such a wonderful dessert! Great job! I have always wanted to try making this. I am drooling over your pictures. I didn’t realize how uncomplicated this dessert is! Can’t wait to give it a try. I haven’t made these in years! Thanks for the memories! I could go for a dish of this right about now. It has been ages since I thought about bananas foster, hubby had never heard of it. Such a simple dessert and one my banana loving toddler would love. This is still one of my favorite desserts! Love, love bananas foster. It’s amazing how the sauce changes the bananas into melt into your mouth goodness. This is truly a yummy retro dessert! I am so inspired by all the great recipes and I want to make them all! This is definitely on my list! So brave! Great recipe choice this week. One of my all time favorite desserts! Love it!